Cyclone Funani finally brings waves to Durban Tuesday, but she was overall a bit of a damp squid. However, Spike calls our attention to Cyclone Haleh who forms close to the coast next week. The current cyclone from Cyclone Funani and the second storm following in her path called Gelena moved into the swell window but were travelling away from Africa, so their 'swell' went south, literally. There were small waves in Durban yesterday morning (Monday), with a slow buildup of a few three foot long-range sets during the day. 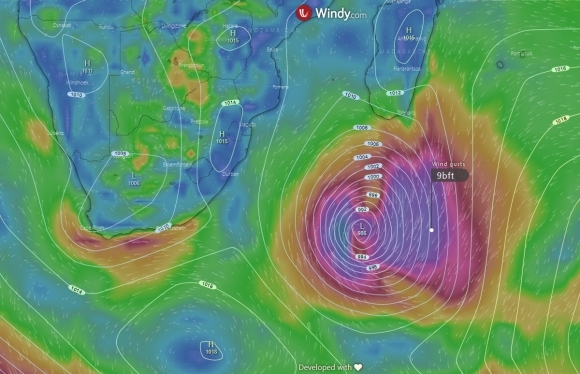 While Funani deepened to a potentially proper swell producing machine of 980mb, the storm had very tight isobars and the cramped gradient made for a very short distance for the wind to blow. 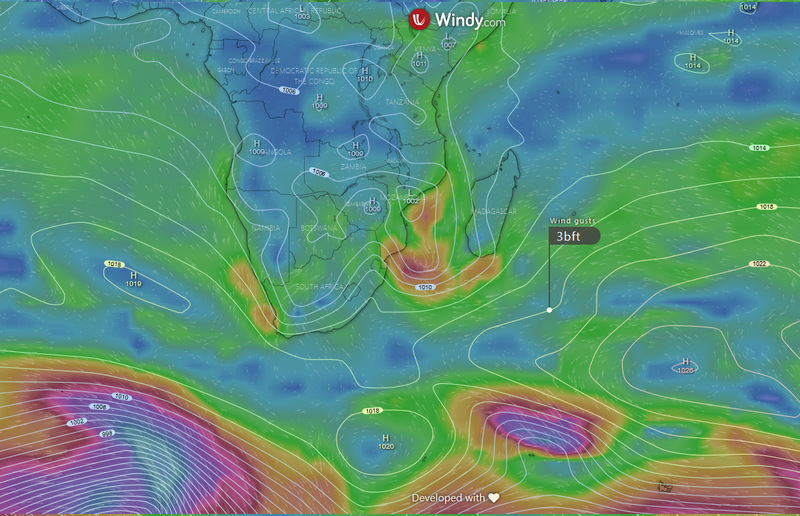 Her passage away from Africa, and her wind focus more to the east than to the west, negated the swell for Durban. The distance of 2000 miles wasn't great either. However, Durban did get swell today (Tuesday), with solid 4-5' bombs on the northern beaches as a bit of the ESE 15 second swell filled in, including another mild pulse from more of a SE angle. However, there's plenty more coming. A promising system - by contrast it forms a LOT closer - starts as a tropical disturbance on the Mozambique coast next Sunday and deepens on Monday 18 February. By this stage, it's deepened to 998 mb and has moved into the ocean, with the wind directly opposite Durban, firing a big unruly cyclone swell straight at New Pier. Unlike the one that was 2000 miles away and moving away, this one moves right into the firing line with the swell coming off the conveyor belt with only 200-300 miles to travel before it hits. If the current very early forecast is to be believed, the surf builds on Tuesday 19 February from 4ft to 8ft by lunchtime. The good thing about this one is that it continues deepening and strengthening while moving slowly until Tuesday night it is 400 miles SE of Durban. Judging by its proximity and strength, the SE swell MIGHT have enough power and energy to refract around the harbour wall and bend in to New Pier for the Cell C Goodwave. The surf should be around 10-15ft+ on open coast, so we can expect proper waves at New Pier of at least five foot but probably more Tuesday, Wednesday, Thursday and maybe even Friday next week.